GrabHitch Etiquette – 7 things you should do as a GrabHitch Driver to improve your experience! 1. CALL or TEXT to confirm your booking! The most important thing to do, once you’ve accepted a passenger, take some time to drop him/her a call or text to tell them about it and make necessary arrangements (such as exact pickup location, timing, number of passengers, etc). 2. Inform all your passengers if it’s not just you in the car. If you are going to be picking up more than 1 hitch buddy, ask them if they are comfortable with other friends or family members going along the same way. 3. Remind your HitchBuddy you are on the way! Before you set off to pick up your passengers, be sure to confirm the pickup timing with your passengers (at least 30 minutes in advance) to avoid disappointment. 4. Complete your ride ONLY after you have dropped off your passenger. It is important that you tap “Drop Off” only after your passenger has alighted. Tapping this means you have completed the ride and it will affect you receiving the fare into your e-wallet for GrabPay payments. Accepted a CASH ride? Complete it too as it will affect any bonuses and rewards that may be applicable to you! Due to unforeseen circumstances, if you absolutely have to cancel the ride, inform your passengers as early as possible (we recommend at least 60 minutes in advance). In our fast paced society, most people want to get to their destination in a timely fashion. Be considerate and inform them you are not able to make it so that they may plan for other modes of transport. 6. Do not charge for ERP gantries. 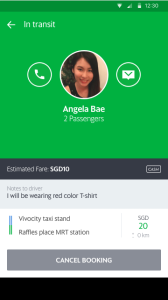 GrabHitch is a social carpooling app which is supposed to defray your daily commuting cost. You would already be paying for this with or without your GrabHitch buddies during your trip. There should be no extra charges to the passenger. 7. Be sociable and network with your GrabHitch buddy. Driving can be a stressful activity, which can bring about rudeness in the nicest of people. When you greet someone with a genuine smile, most probably you will be acknowledged in kind. It can turn frowns into smiles and put everyone in an awesome mood to start the journey! 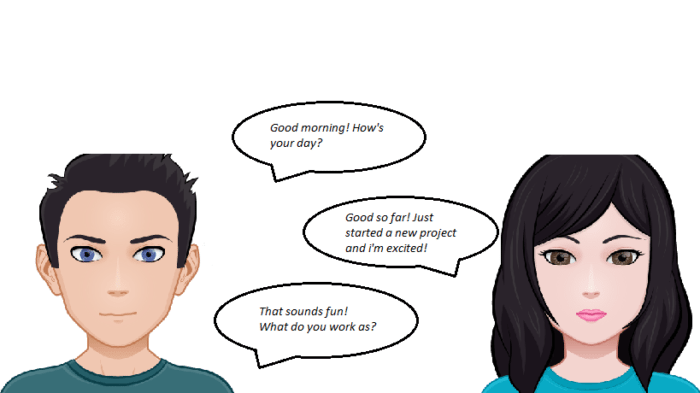 A simple “Good morning, how’s your day” can be a great ice breaker! Crack jokes and include lots of laughter in your conversations. This leaves a more positive and lasting impression of you. If you and your passengers breakout into a carpool karaoke, record it down and send it to us! We’d love to see it! At GrabHitch, we are committed to serving you better. We constantly strive to gather all your valuable feedback and improve our service to best suit your requirements. Most of you would have noticed upgrades to our app that makes it so much cooler to drive with GrabHitch. Click on the links below for more information on each topic! How do I accept a ride request? How do I check my upcoming rides? What do I do when I pick up a passenger? 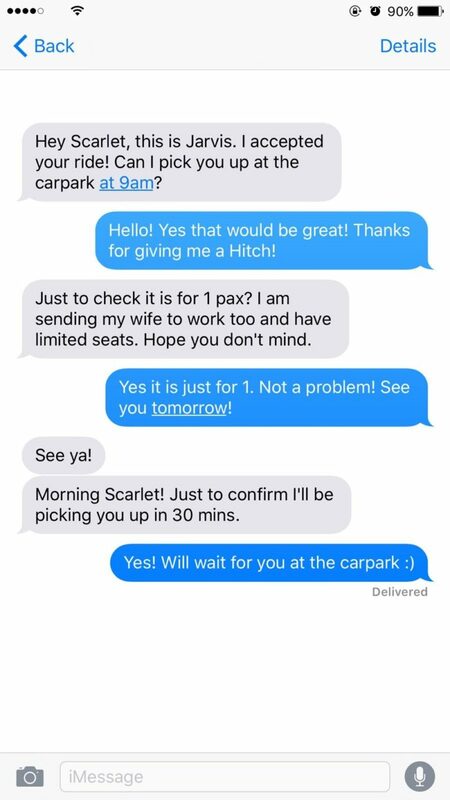 How do I cancel a Hitch appointment? 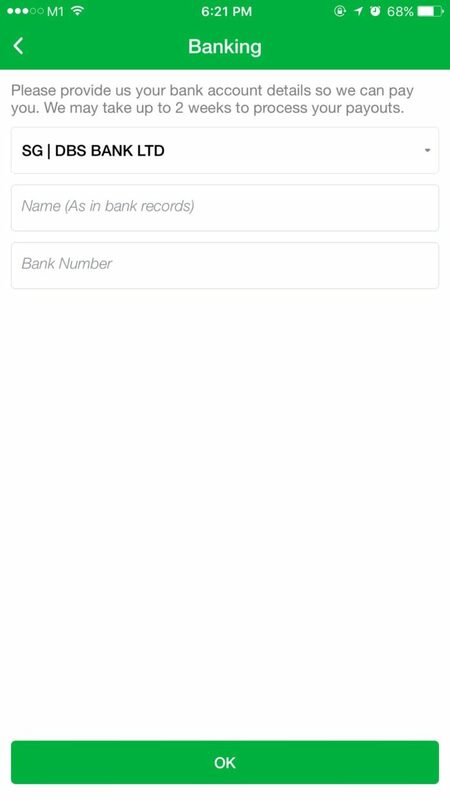 How do I cash out funds from my e-wallet? 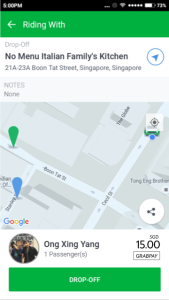 To get to the “Create Route” screen, click on the driver tab when you are in the GrabHitch screen. 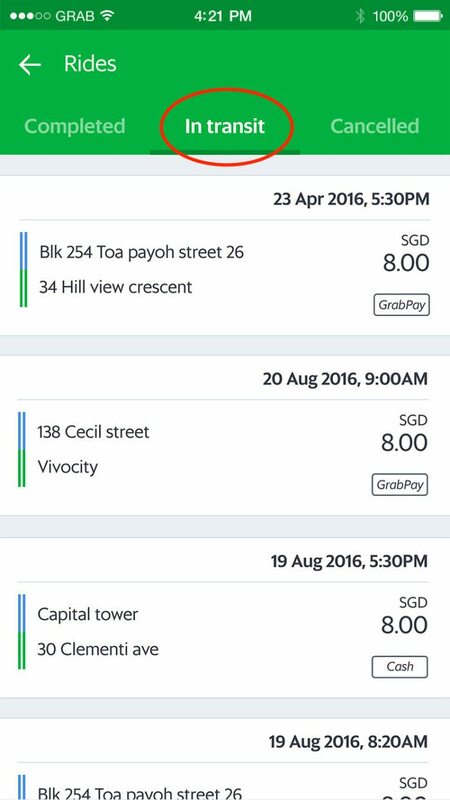 After you enable your GrabHitch driver mode, you will reach the Driver Main Page. Tap “Create Route” to begin. Once you’re matched with a passenger, we will notify you via push notification. This will appear in your app message center. 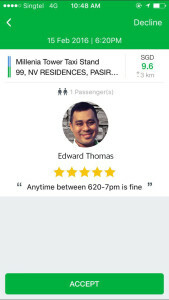 To review and accept the request, go back to the GrabHitch driver main screen. Tap on the routes you previously created to see the passenger who you’ve been matched to. 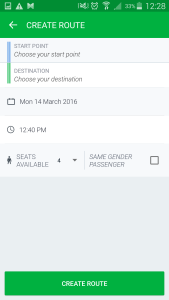 On this screen, You will be able to see details of the passenger and his/her trip. Tap “ACCEPT” at the bottom of the screen if you are able to offer a ride. Once you tap “ACCEPT”, the passenger will receive a notification. Do SMS your passenger to confirm details of the ride! 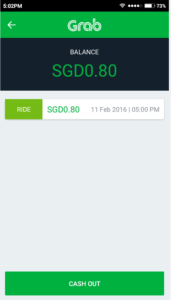 Tap on “Rides” > Under the “In Transit” Tab, you will come to a screen with a list of your accepted rides. A green COMPLETED label means the ride is completed and payment has been made. The YELLOW paying label means that payment is still being processed, it will be changed within 1-3 working days. The blue CONFIRMED label means the ride is upcoming. Tap on the ride to see your passenger details and directions. A grey label means the trip was CANCELLED. When you are ready to pick up your passenger, go back to the Driver Main Screen, click on “RIDES” and then the route with a blue confirmed label. Once you are at the pick up point, tap on “I’M HERE”. This notifies the passenger that you have arrived. Once the passenger gets into the car, tap on “PICK UP” and you’re on your way! Upon reaching the drop off point, find a convenient and safe location to stop. Ensure the passengers get off safely and then tap on the “DROP OFF” button. Remember that payment can be in cash or GrabPay. You will see GrabPay transactions reflected in your e-wallet, on the main driver page under “BALANCE”. HOW DO I CANCEL A HITCH? 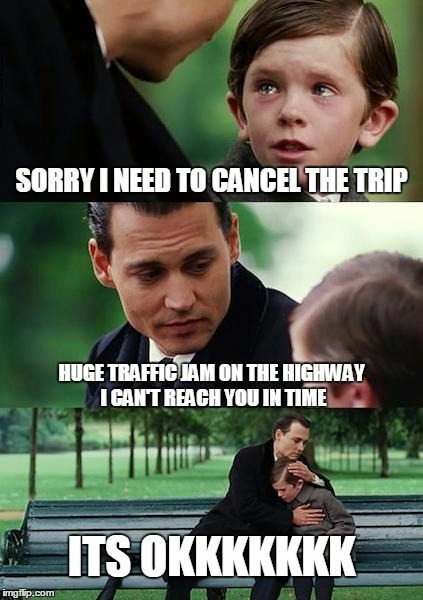 On some occasions, you might need to cancel a ride after you have accepted it. At the driver screen, click on the Rides section. Your upcoming rides are denoted with a blue tab. Click on the ride and then swipe upwards to see more details about the passenger. You can cancel the ride on this screen. As GrabHitch is a social platform, do remember to call or message your passenger to let them know that you are unable to give them a hitch. Do the same as you would do for a friend. Who knows, you might hitch the same person again in the coming weeks. GrabHitch supports both cash and cashless payments. Every cashless ride you do will be paid via credit card by the passenger and it will go into your driver e-wallet. You can see your balance directly on the driver screen. 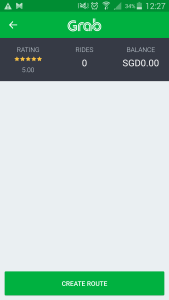 In order to cash out the money, all you have to do is to click on the cash out button. The first time you cash out, you will be asked to key in your bank account number. Please note that cash out transactions are processed every Friday. You should receive the payment in your bank account by the following Friday.